Star Wars Lando Movie Coming 'In the Future' | Nerd Much? 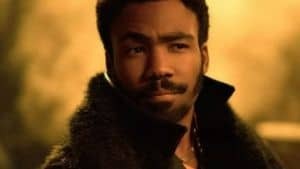 News began popping up of late that the next movie from the “A Star Wars Story” brand of films would headline none other than Donald Glover’s Lando Calrissian. The hype came fast, but it was apparently all for naught. It appears that confirmation of Star Wars Lando was a mere mistranslation from a foreign reporter. The quote seems straight forward. The next Star Wars spinoff will be about Lando Calrissian. However, Lucasfilm reps quickly squashed all of these stories and confirmed Kathleen Kennedy never said any such thing. Representatives later confirmed the mistranslation to i09, with the rep stating “[Kennedy] said it’s something she’d like to do one day in the future.” So while Lucasfilm isn’t confirming it’s the next spinoff film coming, it’s certainly a story the studio is interested in telling. Solo: A Star Wars Story is hitting theaters on May 25th. And while the movie is getting decent reviews, everyone seems to be absolutely glowing in regards to Donald Glover’s performance as Lando. It’s almost a no brainer to give the character and actor combination of Lando Calrissian and Donald Glover a shot at headlining a movie sometime down the line. That being said – where the hell is our Obi Wan/Ewan McGregor movie, Lucasfilm!